CASE REPORT: The Efficacy of Chiropractic Adjustments in the care of Migraine Headache with patients presenting with cervical disc bulge. Title: The Efficacy of Chiropractic Adjustments in the care of Migraine Headache with patients presenting with cervical disc bulge. Abstract: Objective: To explore the efficacy of chiropractic adjustments, and non-surgical spinal decompression in the treatment of cervical spine disc conditions presenting as neck pain, migraine headache, dizziness and visual disturbances. Diagnostic studies included physical examination, computer aided range of motion, orthopedic and neurological examinations, plain film x-ray studies, brain MRI, cervical spine MRI examinations. Treatments included specific spinal adjustments, low level laser therapy and spinal decompression. The patient’s outcome proved excellent in reduction of neck pain, headache severity and frequency as well as elimination of dizziness and visual disturbances. Key Words: Migraine, chiropractic adjustment, disc bulge, spinal decompression. Introduction: On 11/19/13 a 37-year-old female presented for examination and treatment of neck pain, migraine headaches with associated dizziness and visual disturbances. The patient denies and recent injuries. Presenting Concerns: The patient reports neck pain in the cervical occipital region as a 4 on the Verbal Analog Scale of 0 meaning the complete absence of pain and 10 being unbearable pain. The duration of the current symptom picture is 2 years and 1 month. The patient further reports episodic migraine headaches starting at the upper cervical region and progressing into her occipital area. These episodes are accompanied by dizziness and visual disturbances described as kaleidoscope vision. At the time of the initial consultation these episodes were occurring 2-3 times per week. The patient reports being afraid to drive her car due to concerns about headache onset. The patient reports past consultations with her medical doctor who diagnosed her with vertigo and previous chiropractic care without results. The records from both consultations were reviewed personally. Clinical Findings: The patient presents with complaints of neck pain, headaches, dizziness and visual disturbances of 2 years duration. The patient is a 37-year-old female who is a mother of 2. The ages are 16 and 3. The patient’s Review of Systems and Family History were unremarkable. Palpation/Spasm/Tissue changes: The patient was evaluated by palpation and observation with the following findings: Bilateral cervical spine spasms rated at +2 in the cervical-occipital region. Orthopedic testing was unremarkable. Range of motion examination revealed mildly decreased left lateral flexion, moderately decreased flexion, right lateral flexion and extension. No pain was produced during range of motion examination. Neurological Examination: Biceps, Triceps and Brachioradialis reflexes were rated at a +2 bilaterally. Sensory examination revealed normal sensation bilaterally for dermatomes C-5 through T1. Motor/Muscle testing revealed 5 out of 5 bilaterally for Deltoids, Biceps, and Triceps, Forearm and Intrinsic Hand muscles. 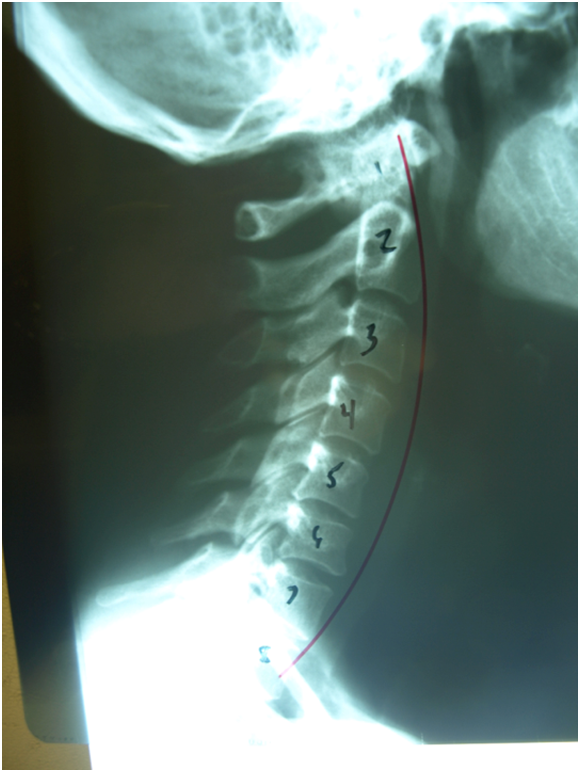 Radiographic findings: reversal of the cervical curve with altered C5/C6 disc space is noted. (Fig. 1, (A) (B) A small osteophyte is observed on the posterior inferior body of C5. Flexion malposition of C5 is also noted. (Fig. 1, (B). Fig. 1, (A), (B) show loss of the cervical lordosis, flexion malposition of C5, partial collapse of C5/6 anterior disc space. Fig. 1. (B) shows upon magnification a small posterior-inferior osteophyte. 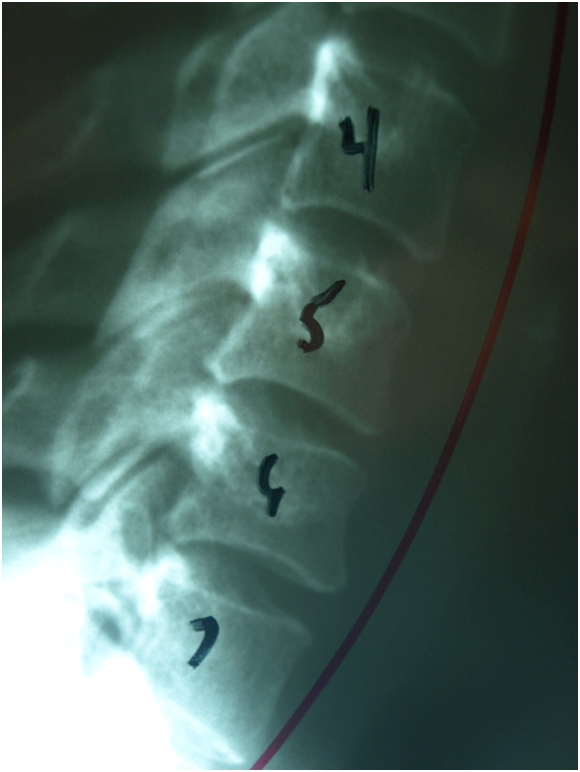 C5/6 central disc herniation contacting the ventral cord. Diagnostic Focus and Assessment: Diagnoses considered are: Brain Tumor, Cervical Disc Displacement, and Cervical-cranial syndrome. A brain MRI was ordered and produced normal findings. Diagnostic reasoning included the C5/C6 disc/osteophyte complex and the encroachment into the ventral aspect of the central canal and contact with the cervical spinal cord. (1) Peter J. Tuchin, GradDipChiro, DipOHS, Henry Pollard, GradDipChiro, GradDipAppSc, Rod Bonillo, DC, DO. Received 29 June 1999. Another consideration was the treatment schedule because the patient lives 60 miles west of the clinic and 2 treatments was the ordered therapeutic schedule. 1. Specific Spinal Adjustments: utilizing a Sigma Precision Adjusting Instrument to introduce a percussive force of 20 lbs. with a maximum of impact number of 50. 2. Spinal Decompression: A Hill Spinal Decompression table was utilized with 8 lbs. of pull maximum and a cycle of 5 minute at maximum and 5 minutes at reduction to 50% over a 25 minutes treatment session. The patient completed 18 sessions in total. 3. Low Level Laser Therapy was used to promote healing on a cellular level using a Dynatron Solaris system. Treatments consisted of 30 seconds of exposure to an 860-nanometer beam at C5/C6 and C6/C7 levels. Follow-up and Outcomes: The patient’s compliance to the treatment schedule as rated at 9 of 10. Completion of the recommended 18 treatments required 1 week longer than anticipated. For personal reasons the patient missed 2 treatment sessions but made them up by adding a week to the estimated completion date. Upon discharge examination the patient reports her neck pain on the Verbal Analog Scale a 2 of 10 with 0 being the complete absence of pain and 10 being the worst pain imaginable. She further reported her headaches as a 1 on the Verbal Analog Scale. Both symptoms were constant since 10/01/11. This is duration of 25 months prior to her first visit. Her symptoms of dizziness and visual disturbances have been absent since 12/13/13. Discussion: Headaches and Migraine Headaches are a big health problem. It has been estimated that 47% of the adult population have headache at least once within last year in general. More than 90% of sufferers are unable to work or function normally during their migraine. American employers lose more than $13 billion each year as a result of 113 million lost workdays due to migraine. (2) Schwartz BS1, Stewart WF, Lipton RB. J Occup Environ Med. 1997 Apr; 39(4): 320-7. This case report is very limited because it represents the experience and clinical findings for just 1 patient. 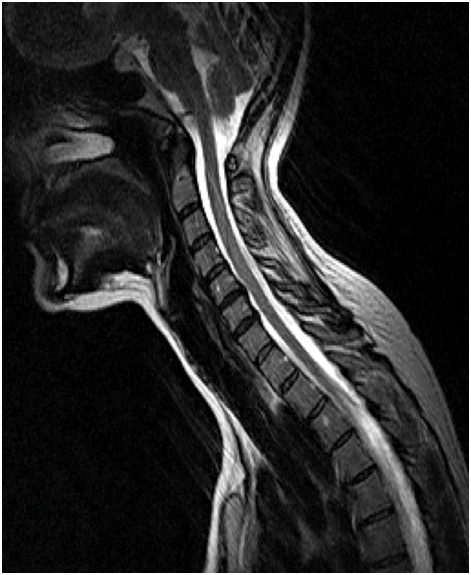 However a study of the references included with this report as well as reports by care providers as well as testimonials from patients indicates that more study should be invested in the relationship of the cervical spine, its structures and biomechanics during the diagnostic workup on headache and migraine patients. Informed Consent: The patient provided a signed informed consent. Competing Interests: There are no competing interests writing of this case report. De-Identification: All the patient’s related data has been removed from this case report. 1. Schwartz BS1, Stewart WF, Lipton RB. Lost workdays and decreased work effectiveness associated with headache in the workplace. 2. Vernon, H., Humphreys, K., & Hagino, C. (2007). Chronic mechanical neck pain in adults treated by manual therapy: A systematic review of change scores in randomized clinical trials, Journal of Manipulative and Physiological Therapeutics, 30(3), 215-227. 4.Mark Studin DC, FASBE (C), DAAPM, DAAMLP, William J. Owens DC, DAAMLP Chronic Neck Pain and Chiropractic. A Comparative Study with Massage Therapy. 5. D’Antoni AV, Croft AC. Prevalence of Herniated Intervertebral Discs of the Cervical Spine in Asymptomatic Subjects Using MRI Scans: A Qualitative Systemic Review. Journal of Whiplash & Related Disorders 2006; 5(1):5-13. 6. Murphy, D. R., Hurwitz, E. L., & McGovern, E. E. (2009). A nonsurgical approach to the management of patients with lumbar radiculopathy secondary to herniated disk: A prospective observational cohort study with follow-up. Journal of Manipulative and Physiological Therapeutics, 32(9), 723-733.